Check out MME research papers program during our upcoming conference in Montreal below. Mobile News Business Models: Promise or Pitfall? Communication Trade Associations: Increased Value under Increased Competition? What Motivates Online Shoppers to “Like” Brands’ Facebook Fan Pages? Here our next in the series of Q & A with scholars researching topics relevant to our division. Q: How are Arizona State University students involved with the Public Insight Network (PIN) to help media organizations connect with sources? The Cronkite School’s PIN bureau has been in “soft launch” mode during the spring semester. We have three students who have been working with about a dozen media clients around the country, which include television stations, newspapers, news websites and radio stations. They work under the direction of Rebecca Blatt, who came to the Cronkite School from WAMU-FM in Washington, D.C., where she was senior editor for special projects and managed PIN operations for the station. As with all of our professional programs, students commit to at least two full days a week in the bureau, making it a truly immersive experience for them. They are working directly with editors at client news organizations, constructing queries, mining the network for stories and sources, and engaging with both clients and sources. So far their work has produced stories on topics ranging from the Affordable Care Act and health care to the gas boom and its impact on communities. They also have assisted with stories on the ramifications of growing economic disparity, problems facing veterans returning from the wars in Iraq and Afghanistan and the buying and selling of guns. Not all of the stories are serious: Students also have helped news organizations develop stories on the 50th anniversary of the Beatles coming to the U.S., the pros and cons of various kinds of mattresses and the best places to go sledding after a snow storm. We’ll have four or five students working in the bureau this summer, and in the fall we’ll have a full contingent of about a dozen students assigned to the bureau, working with even more media organizations across the country. Q: Another component of the project at ASU is to develop business models for PIN. What have you learned so far in the “soft launch” that looks promising? The work students are doing now is key to assessing what services news organizations most need and how we might respond to those needs. Students have learned a lot already about how to manage work flow, communicate effectively with clients and follow the PIN procedures and protocols established by American Public Media, where PIN resides. Next, they’ll delve into the business side of the operation. This week a professor from ASU’s W. P. Carey School of Business will be visiting the bureau to talk to the students about how to go about creating a business plan. Developing business and marketing plans as well as a pricing structure for services will be a priority for this summer. Students are really excited about this as they will be essentially helping to launch a small business. Our plan is for all of this to be done by the fall semester, when the bureau will be in full operation with paying clients. Q: Looking ahead, what are some other projects the PIN bureau might undertake? We’re learning something new every day, and we’re very open to where clients might lead us. We want to develop visualization templates, for example, that help news organizations display information in an appealing and accessible way. We’re working on an engagement platform that would allow people within the PIN to talk to each other around specific topics and interest areas. We want to bring PIN into local television news, which has not used the network extensively but clearly is committed to the principles of community building and audience engagement. We’ll be building use of PIN into our own professional programs so that our students learn to report more deeply and meaningfully. And we’re considering how to teach audience engagement more fully in our traditional reporting classes so that students emerge with an audience-first mindset and the skills they will need to succeed in the new digital media world. We have three years under a grant from the Knight Foundation and APM to experiment with the PIN bureau and see what works. Our hope is that we will be able to sustain PIN long term, deepen and broaden an understanding of audience engagement in both the academy and the professional, and perhaps develop some new ways to connect with audiences in the shaping and delivery of news. Kristin Gilger is associate dean in charge of professional programs for the Walter Cronkite School of Journalism and Mass Communication at Arizona State University. She directs the school’s 70-plus part-time faculty members, oversees a growing roster of professional programs and serves as a liaison to the news industry, in addition to teaching. Gilger was director of Student Media at ASU from 2002-2007, directing student publications. Prior to coming to ASU, she spent 21 years in various reporting and editing roles at newspapers across the country. She was deputy managing editor for news at The Arizona Republic, managing editor of the Salem (Ore.) Statesman Journal, and served in several editing roles at the Times-Picayune newspaper in New Orleans, La. She has done training in media management, leadership, ethics and writing around the country and the world for the Poynter Institute, Associated Press Managing Editors and the U.S. State Department as well as a number of individual news organizations. Gilger holds master’s and bachelor’s degrees in journalism from the University of Nebraska. She is the winner of numerous awards, including the National Headliner Award for a project on race relations in Louisiana. Additionally, she has supervised a number of student projects that have won awards that include three Robert F. Kennedy Journalism Awards for reporting on social justice. With summer break now here for most of us, we’d like to begin populating our division blog with contributions from YOU. Now that the grind of the traditional academic year is complete, you can have some fun by writing a short piece (no more than 500-800 words is needed, really) to share with your fellow division members. Is there a current event or media management and economics topic in the news you’d like to extrapolate on with your insights? Write a blog post. Was there a session that stood out to you at a recent academic or industry conference you attended? Write a recap for our blog! Is there an upcoming conference or program you’d like to promote? Is there some recent research you’ve published or are working on that you’d like to share with a wider audience? Write a blog post! Please send any contributions to our blog in a Word document to me at geoffrey.graybeal@ttu.edu and we’ll publish them. Q: You’re studying news engagement of high school students in Texas. Where are you at with this project? I am finalizing plans to launch the study in two high school social studies classrooms: Lubbock High School and Coronado High School. I’ve received approval from the Lubbock Independent School District research chair and the social studies coordinator, Joni Rodela, who has identified two teachers known for their student engagement and use of current events in class. The two schools are fairly different, with Coronado offering a more diverse student population, which is important. These teachers will each conduct one experimental and one control section. The experiment involves a 5-minute daily news game in which students in the experimental section are assigned to teams, which then compete with the instructor and each other over current events knowledge. An important and unique part of extending the study from college to high school classrooms is that researcher funding was used to buy three dozen short-term subscriptions to the local daily newspaper, the Lubbock Avalanche-Journal, which will be made available to needs-based families which don’t subscribe. The hope is that these underserved families, after being exposed to the experiment, will opt to continue subscribing after the 3-month study period ends. I hope to launch before the end of the current semester but because of IRB and logistical delays, it may be fall before this study launches at the high-school level. I also intend to work with my new contacts in the school district and these two schools to bring journalists, journalism faculty from Texas Tech and newsmakers into high school classrooms in an effort that I hope will leave students more engaged in the news and more likely to consider a journalism career. Q: How is your project different from other youth news engagement studies that have been done? Traditional efforts, like Newspapers in Education, are important and have served as guides for future engagement. But I think it’s imperative to make news engagement more interacting and, frankly, entertaining. The addition of a game element brings with it the opportunity for a more organic interest in following the news because there are now competitive, engaging and social reasons to be up to speed on current events. It is easily replicable and linking it with local journalism faculty and journalists – especially exposure to newspapers in the home – makes is unique and important to the industry – and to informed democracy. This is also a logical area for the pursuit of extramural funding, and not from traditional journalism foundations but rather from educational foundations and agencies, which may offer more viable opportunities for funding. Obvious uses of the funds are newspaper subscriptions, honoraria for newsmakers and journalists to visit classes and monetary incentives for the teachers conducting the experiment. Q: You also use news engagement activities in your classes. What has been the most surprising thing you have learned? 1) We should to make news knowledge more engaging. This can, and should, involved making it more entertaining, necessary and relevant. Think about how often you see a high school student in a news story, or how often an education beat reporter covers issues of relevance to them, like college admissions strategies, costs, employment opportunities, questions about curriculum changes, etc. We need to cover this population more and better which takes away one excuse for avoiding the news. Then we need to work to make news more necessary by regularly illustrating the role of news in society. Finally, my news game is an attempt to pair news…and fun. 2) We need to work harder to get news into the spaces where these students already are: Mobile and social media (and not just Facebook, but Instagram, Pinterest, Twitter…). News alerts can, and should, target this demographic and it makes sense to consider hiring very young journalists to work in the social media space. They (like, literally) speak the language and can bring an authenticity and appeal that someone my age simply can’t. I advocate for social-media internships and even part-time jobs to give young, aspiring journalists an entry into the industry. Q: Looking at your research findings as well as your classroom experiences, what advice would you give media managers looking to increase their organizations’ engagement with teens and young adults? As I mentioned above, we need to do a better job using the resource that is digital natives and putting them to work for us using mobile and social media. Research shows that journalists use Twitter, for example, to promote their existing content (including links to a mainstream news website), to search for sources and information, and to engage the audience. That makes it a rich environment, then, to increase engagement with teens and young adults by exposing them to news, getting them involved in stories and joining the conversations they’re already having. We’ve tried reaching youth by changing the content – we need to try harder to reach them by making fundamental changes in how we produce, distribute and discuss news. Kelly Kaufhold, Ph.D., worked for 20 years in the media in Ohio, Texas and Florida as a print and broadcast journalist before returning to graduate school for a second career. He now teaches all things digital media in the College of Media and Communication at Texas Tech University, where he was just honored as a top new faculty member. He created and teaches the innovative course Storytelling by Smartphone and is heavily involved in Texas Tech’s multimedia journalism sequence. He also teaches web design, serves on the graduate faculty and has published research on new media in Newspaper Research Journal, Journalism and Mass Communication Quarterly, the International Journal of Media Management and elsewhere. He is a co-editor, along with Amber Willard Hinsley and Seth C. Lewis, of The Future of News. 4) how editors and contributors may together improve scholarship, research, and cooperation within their fields. The journal editors listed below represent a cross-section of mass communication journals. Thus participants will receive information about how to be published in the journals that are represented that includes general information about standards for publication throughout the field. The panelists, discussant, and moderator will remain up to one hour following the panel (i.e. 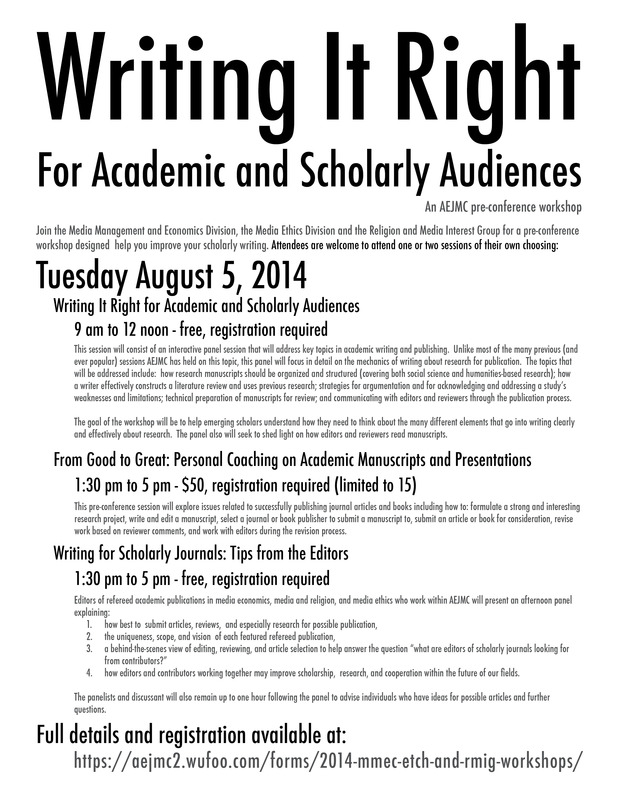 from 3-4 p.m.) to speak with and advise individuals who have questions and ideas for possible articles. For AEJMC conference registrants there is no charge for either the panel or the advising. Participants should contact Dr. Tom Cooper (twcooper@comcast.net) to reserve a space. Lee Wilkins, past editor, JOURNAL OF MASS MEDIA ETHICS, Wayne State University. Media entrepreneurship is hot right now. For starters, look no further than popular culture for signs that media entrepreneurship is in vogue. The new HBO comedy, “Silicon Valley” centers on an up-and-coming music website startup (with a killer compression code) called Pied Piper. The show is similar in subject matter to an Amazon original show, “Betas,” a comedy that focused on a group of entrepreneurs in an incubator creating a new social networking dating app. The two comedies spoof the Bay Area tech culture with companies and characters similar to Mark Zuckerberg, Facebook, Twitter and Google among others. Lest you think these shows have everything to do with entrepreneurship and innovation and little to nothing to do with MEDIA entrepreneurship, I would point you to Cindy Royal’s recent Nieman Lab post proclaiming, “media is tech.” (The Texas State University journalism professor has a unique perspective having just completed a year-long fellowship at Stanford University). Need further proof of the popularity of media entrepreneurship? Look at ABC’s hit television show, “Shark Tank,” where investors pitch their products and ideas before a panel of “shark” investors. Dallas Mavericks owner Mark Cuban, who made a fortune selling broadcast.com to Yahoo! in the late 90s, is the resident “media shark.” But other sharks have also funded media and tech companies; while the show features entrepreneurs from all walks of life, media companies appear rather frequently. Just this season, a couple sold Cuban on a children’s book recommendation website, for instance. While not every entrepreneur is as fortunate to hook a big fish investor, many other startups turn toward social networks to raise funds for their ventures. Many media products, ranging from album releases to independent films, have been funded through popular crowdfunding sites such as Kickstarter and Indiegogo. Legacy media companies are also getting into the game of making entrepreneurial investments. Turner Entertainment started an accelerator program called Media Camp that provides mentoring and seed funding to a handful of promising media startups each year. They’re not alone. For the past two years, Sprockit has showcased a few dozen promising media startup companies on the trade floor at the National Association of Broadcasters’ annual NABShow in Las Vegas. These companies range in subjects from social media for broadcast news stations (Social News Desk) to a sports video capturing and sharing app (SportXast). Sprockit receives support from Comcast, Disney ABC Television Group, Cox Media Group, Gannett Broadcasting, Google, Hearst Television, Tribune Broadcasting, Univision Communications and the AARP. Recognizing the changing media environment, universities have been increasingly adding courses and programs pertaining to media entrepreneurship to their curriculum. Much like universities compete on the hardwood each spring, programs for the past few years have been able to compete in Student Startup Madness. The brainchild of Sean Branagan, director of the Center for Digital Media Entrepreneurship at Syracuse University’s Newhouse School, the top teams advance from regional competitions to the “Entrepreneurial Eight” finals, held at the South by Southwest Interactive Festival in Austin, Texas each year. Despite our journals leading the way in publishing seminal research on media entrepreneurship for at least a decade now (e.g. Hoag & Seo, 2005; Hoag, 2008; Hang & Van Weezel, 2007; Haas, 2011), our field of Media Management and Economics has been, for the most part, largely missing from the current curricular push to expand media entrepreneurship efforts. Ferrier (2012) notes that these courses, called “digital media entrepreneurship,” “media entrepreneurship,” “entrepreneurial journalism,” or “new media ventures,” are designed to introduce students to entrepreneurship and the startup culture. A 2013 report on the state of entrepreneurial journalism education (note: link downloads file) in six countries (Vázquez Schaich & Klein, 2013), concludes that there are ample opportunities to increase collaboration between entrepreneurial journalism efforts with those of our media management and economics field. In fact, in the United States at least, “entrepreneurial journalism” has been leading the media entrepreneurship movement, often funded through journalism-oriented foundations (e.g. Knight Foundation at CUNY, Arizona State and others; Scripps Howard at Ohio University). While journalism is certainly important, a narrower focus on entrepreneurial journalism rather than a more broader emphasis on media entrepreneurship could unnecessarily exclude student innovation in areas such as film and television entertainment, music, sports media, and technology (which you’ll recall is media per Cindy Royal), just to name a few. More often than not journalism innovation in the past decade has occurred from outside traditional journalism industries. Meanwhile, many stalwarts in our field of media management and economics find themselves in business schools, not communication schools. As colleges and universities expand their programmatic offerings, more is certainly better than less. I’m buoyed by these efforts and excited by what the future holds as more and more universities equip students with an entrepreneurial mindset to innovate in a variety of media industries. Our division not only can, but perhaps should, play a bigger role in leading and shaping these changes. With media entrepreneurship part of the global theme of the next World Media Economics and Management Conference in New York City, the 2016 event makes for a perfect platform to showcase our division’s scholarship and pedagogy in these areas. But we don’t have to wait two years to continue to make advances in spreading media entrepreneurship. We can continue to stoke the flames of media entrepreneurship to ensure a passion for innovation burns within the next generation of media creators. Geoffrey Graybeal, Ph.D. is an assistant professor in the College of Media and Communication at Texas Tech University, where he teaches courses on Media Entrepreneurship. He serves as bibliographer and community outreach officer for the Media Management and Economics division of AEJMC. The scores are in and here are the winners! Congratulations to those listed below. We look forward to hearing about your research in Montreal, as well as all other papers accepted for presentation. Forty papers were submitted in this year’s paper competition, with a 62.5% acceptance rate. Five papers were disqualified due to self-identifying information within the manuscript. Despite AEJMC and MME division’s best efforts to communicate how to properly clean a manuscript prior to submission, this continues to be a problem. Please take time to carefully review your manuscripts prior to submission to ensure a clean upload. We do not want to miss out on the wonderful research being conducted by our division. MME organizes pre-conference workshops – time to sign in!